I was especially thrown out by the proof on The Transversality Theorem on the point "we want to exhibit a vector $v \in T_x(X)$ such that $df_s(v) - a \in T_z(Z).$"
I understand so far that in order to show that $f_s \pitchfork Z$ we need to show $df_sT_x(v) + T_z(Z) = T_z(Y)$. But why we want to show "a vector $v \in T_x(X)$ such that $df_s(v) - a \in T_z(Z).$"? I guess I lost some general idea here. I am looking forward a detailed answer which fills up what author omitted.. Thank you! So, we need to show $df_s(T_x(X)) + T_z(Z) = T_z(Y)$. Let $a\in T_z(Y)$ be arbitrary. We want to express it as a sum $$w+w'=a$$ where $w\in df_s(T_x(X))$ and $w'\in T_z(Z)$. That is, for $w$ there is a $v\in T_x(X)$ such that $w=df_s(v)$, and $w'=a-w$ must be in $T_z(Z)$. Not the answer you're looking for? Browse other questions tagged differential-topology or ask your own question. How to construct a vector field without zero on an open manifold? Given a smooth map, find another similar map with a differential that is never zero (Guillemin and Pollack 2.3.8). 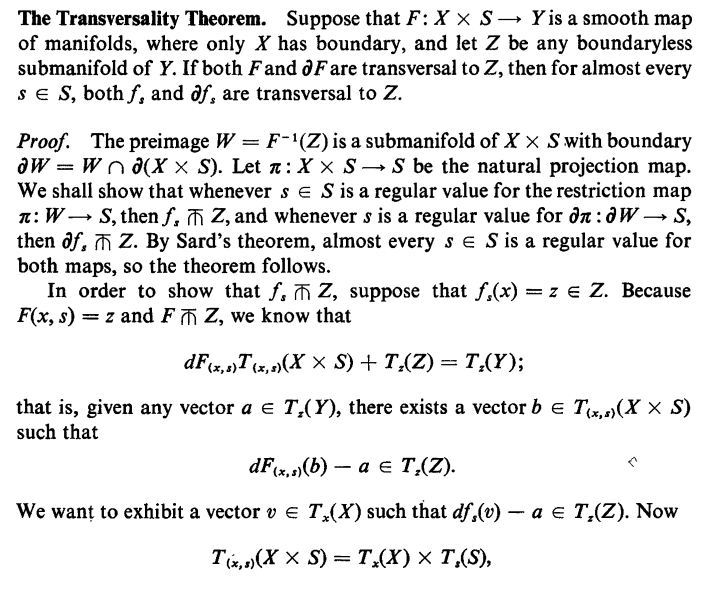 Thom Transversality Theorem for non smooth manifolds? Differential vector field that vanish in the sphere.